St. Andrew's Presbyterian Church: a church community of faithful disciples of Jesus Christ, worshiping in Owen Sound, Ontario. 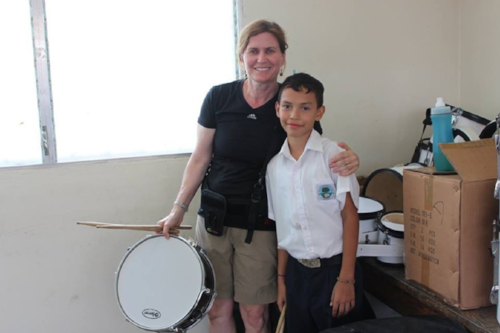 St. Andrew's has a long and successful history of cross-cultural mission trips. Our congregation has sent teams to Nicaragua with PAN Missions 3 times over the last decade, as well as participated in a Youth in Mission trip (PWS&D) to Malawi in 2013. What a heart for service! A PAN Missions Medical Service Team from St. Andrew’s headed to Nicaragua in July of 2014. Our team of 21 included 9 young people and 12 adults, including a nurse, a pharmacist and a doctor. 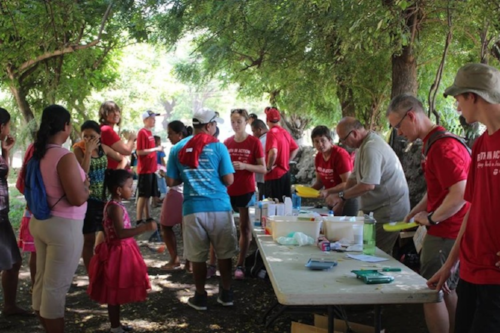 From July 9 until July 24, they operated 5 temporary medical clinics in remote rural areas of Nicaragua, as well as tending to other needs in an impoverished nation. Our team visited hospitals, cancer clinics, orphanages, schools, feeding centres, churches and a baseball academy and delivered much needed assistance to those in need. Here are some more pictures of our clinics. Peter Struthers and Johnathan, one of our translators. Without Peter, we would never have been able to make our clinics work! We were able to give out many of the items donated to people in need. Jeans (and jean jackets) are a hit commodity! We held an outdoor clinic at our 3rd location. This is our pharmacy. Anna and Sarah await their first patients at the weigh scales. Anne takes notes as she does triage. Jenny takes a woman's blood pressure at the clinic. Sports, crafts, games, and bubbles are important elements of all our clinics. They provide wonderful opportunities to build community with the people we meet at our clinics. And they give many children and adults a few moments to play and laugh and have fun. Bubbles are always a big hit! Sarah's bubbles delight these children. Luc brightens up this child's day with some face paint. These boys show off their skills at one of our clinics. Christian community is built everywhere in similar ways...listening to God's word, expressing hospitality, working and playing together, studying the bible together, and cooking and eating together. What we've found out is sometimes it just looks a little different in other countries. We worshipped together Sunday in Grenada at Iglesias de Nazareno III . We experienced amazing hospitality and saw that this Christian community has a vibrant vision to share God's love. Our hosting church invited Pastor Dana to preach which was wonderful and her message was very well received. We were awed by the size of the church that the Canadian community of Milverton partnered to build. They began, initially, with a Sunday School. So many children came that they had to run it on Saturday, too. When so many came on Saturday the had to split into two groups. They are now up to three hundred children. A Joy sports team helped create a sports pad to play on. This is a church with vision and energy because they are now eyeing the property nearby to build a place to care for unwed mothers. This church understands mission! In the meantime, there is a "Tiki Hut" at the back of the property with a kitchen building behind it where delicious fruit bowls were served to us with gracious hospitality. The similarity of our traditions was quite consistent but the resources we have to use look very different. The equipment and shelter might vary but God's love and praise is present in both. I was overwhelmed at times by the gracious thanks out poured to us. I hope I will remember this role modelling when I greet visitors at St. Andrew's. After church a member of the congregation invited us to his waterfront property on Lake Nicaragua. We were able to purchase a delicious lunch of either fish, chicken or beef. It was served by the waterfront and was delicious. Several members of the congregation joined us. Following this we were taken on a lovely cruise on the Lake learning about the many islands and birds that lived there. We visited Monkey Island where the monkeys come close to the boat hoping for treats. At the end of the cruise some of us went for a swim and were surprised to find a herd of cows had joined us. This caused some of us to rapidly swim for shore! Our translator, Raquel, overcame her fear of swimming to give it a try and was an amazing swimmer. On our way home we had a wonderful stop at the Grenada market where we shopped and met a new favourite Nicaraguan named Allan who is a professional artist. (That's another story, though. Returning home after our long day we shared our Joys and Concerns giving thanks for the amazing day and praying for God's help with our concerns. In the favourite words of Craig this day was OUTSTANDING. PS. Be sure to check out the last few posts. New pictures have been added! At Casa Shalom there is a large storage shed called a bodega and it houses donations for Missions. Some members took time to sort through many boxes to add to our donations of clothing. All members of the team participated fully at our medical clinics and even our drivers Victor and Chepa helped and had fun with it! One particular case which I thought was very sad was that of a six-year-old boy with cavities in all of his molars. His molars were black and rotting. His Mom had taken him to the dentist but he couldn't have the teeth removed because there was no anesthic. We are very fortunate in Canada to have access to proper dental care. The team gets better at every clinic coming together with co-operation, professionalism and care! I am amazed by the camaraderie of the team members and of the support staff. Sandwiches, yogurts and drinks which were prepared the night before were shared by all of us. After we traversed the river in our 15-passenger cube van we set off for our long ride home. The scenery was stunning and it felt good to be heading home to Casa Shalom!. and through the rivers, they shall not overwhelm you. Lesley asked if anyone knew how to play the drums. No one did. So she gave them a little lesson! The children LOVED skipping! We were able to donate over 40 skipping ropes to the children there! The skipping ropes were donated by the Heart and Stroke foundation, in connection with the Jump Rope for Heart program run in our Owen Sound elementary schools. We returned to the orphanage to play some more and share a hot dog BBQ. Over the past few days we have had the opportunity to visit with the children at the REMAR orphanage. The first day we were there, we played games, did crafts, and spent some time with the girls. On Thursday morning, we returned to the orphanage to see the school and visit with the children who attend there. The schools are open not just to the children at the orphanage but also to kids from the community. Many children in Nicaragua can't afford school uniforms or supplies, and others aren't able to complete their education because they need to get jobs to support their families. But the children we met at the orphanage are on their way to improving their lives and their prospects for the future. Teaching the class "Jesus loves me"
Everyone we met seemed happy and eager to be leaning! Feel free to leave comments! We can view them here on our end, and we would love to hear from you! The last few days I had an amazing opportunity to be part of our medical mission offering clinics at two churches in rural Chinendaga. On both occasions we set up a triage area, doctors assessment area and our pharmacy. There were three stations outside for crafts, sports and distribution of donations. There would be an occasional hiccup but for the most part things went very smoothly. The Spanish speaking doctors who accompanied the team to the clinics are all young females with busy jobs and families of their own. They perceive value in our work to volunteer their time to provide care and hope to the needy families with many burning issues. In conjunction to our services, our team has been accompanied by a dentist, lab technologist and a Nurse who provides immunization for children. I wonder if PAN didn't have the initiative to provide medical care would these other services be provided? The dentist pulled out thirteen teeth at one clinic alone. I felt badly for a middle-aged man who arrived late and wasn't able to get a rotten tooth pulled. The only thing we could offer him was an anti-biotic and pain medication. Many of the children seem to be on par with growth and development until age two and after that they seem to lag behind. Almost all the children were treated with anti parasitic medication and vitamins. All donations of clothing, skipping ropes, balls and sports equipment brought joy to the people's hearts. The pastor at our first clinic which was held in a very modest church approached our leaders Doug and Craig with a request for a donation of money towards a keyboard. Any donation of one dollar, ten dollars or more towards their total goal of five hundred dollars would be greatly appreciated. The church ladies have been preparing and selling food outside the church (over an open fire) to fundraise for this purchase. To date they have raised 200 dollars. His graciousness and humility were remarkable. We will be discussing this request at a later meeting when we are dispersing our contingency fund. I believe in the love of God and his love of all of his people. We bring joy and hope to Nicaragua. There are many opportunities to have your eyes fully opened through the eyes of God. I am very happy and excited to be part of this experience! Thank you to everyone back home for all your support and love! Respectfully submitted Anne Struthers & the PAN team. We began Saturday with a thought-provoking devotion about partnership led by Reid. Our team-building continued to climb as we supported each other on the zip lines strung through the lush rainforest canopy, We sailed, bounced, flew like Superman and even hung upside down! We strolled through the colourful Catarina market and gazed at the breath-takingly beautiful lagoon. Our visit with the girls at the Remar orphanage filled us with joy! Nails were painted, hundreds of elastics became bracelets, skipping ropes were turned and soccer balls flew and smiles beamed! Dana's devotion encouraged us to ponder things we should allow to die so that we can experience new life. Our time in Nicaragua is certainly giving us many moments of awakening. We were welcomed with open arms and tears were shed when we arrived at Divino Maestro, the church where our first team-built Sunday school classrooms. There were so many familiar, loving faces. Lisette and Yader introduced us to their fourth son. We met Fanny's precious children. Dana shared a sermon about bearing fruit as part of Jesus's tree and everyone clapped and said "amen"! Our team led the congregation in two lively songs before we reluctantly waved good-bye until we meet again. In the evening we went on a night tour of the Masaya volcano and bat cave. Thank goodness for echolocation because we could feel the bats' wings against our cheeks! The views were spectacular. We feel so thankful for the blessings and opportunities God has provided for us in Nicaragua. Our team has been busily taking pictures of all of our mission activities. Unfortunately, it has been difficult to upload pictures to the website because of file size, lack of editing software, and slow upload speeds. But, here are a few! Stay tuned and more will be uploaded soon! Julia at the feeding centre. Sarah at the feeding centre. After an early wake up, we had a 6:30 am breakfast of porridge, a favourite of many. Following our devotions led by Ann, we departed for our first medical mission close to 2 hours away. Upon our arrival, we unloaded our medical supplies and equipment for the clinic as approximately 50 people needing our assistance waited patiently. Over the 2.5 hours, some served inside while others entertained and got to know the community members by playing soccer, skipping, frisbee and making crafts. Stuffed animals and hand made dolls were an instant hit and the clothing offered caused a happy line up extending from the Sunday school room to the church. The clinic wrapped up shortly after lunch and the extra time we had this afternoon was spent with young community members leading us up the extremely high, steep, thorny 90-minute trek up the mountain overlooking the village. The view was beautiful and magical. We had a great dinner of spicy spaghetti and the "boys and Sarah " played man tracker before reflections. We are super excited for tomorrow's zip lining adventure. Luc, Matthew, Blair, Collin, and Reid. Hello to everyone! After a long trek yesterday, the team is finally all settled in here at Casa Shalom! We started off our morning bright and early and immediately were welcomed by the warm breeze and friendly faces of Nicaragua! Our team had a delicious egg and bean breakfast and were excited to be reunited and/or introduced to Samuel and Jonathan! Many faces lit up with glee at the sight of their friends then settled in for our morning devotions. We were trilled to see that Doug had organized our devotion and were anxious to hear her motivating words. We were presented with the idea the challenge to find Jesus in a special act that you do everyday here in Nicaragua. We were taught about the importance of appreciating your presence here as we act as the hands and feet of our Lord. After reflecting, we packed up in preparation for our exciting day ahead. We decided it was best to exchange our American money to cordobas as soon as possible, so we ventured though Nicaragua where we met at a bank. We then were given a tour of downtown Managua by Samuel and Jonathan. For many of us, this tour doubled as a history lesson on the Nicaragua civil war and government. Feeling educated, we headed to the children's hospital where we planned to paint with some children from the Cancer Ward. We were blessed to be introduced to such beautiful and kind children and to have the opportunity to spend our afternoon with them. We quickly recognized the beauty within our work with the children, and immediately felt the presence of our Lord among us and working through us. Feeling famished, we decided it was best to head back to Casa Shalom for some nice sandwiches. Talking over lunch, we discussed and prepared ourselves for the rest of the afternoon. We were headed to a church service, followed by being a part of a feeding centre. Heading out, we ventured out on our 45 min drive. Upon arrival, the group was immediately embraced and overwhelmed with the beauty present in the church. The energy, love, peace and spirit present was truly breathtaking. Throughout the service, many young girls stood up and sang for the congregation. Becoming excited, we decided that the group would get up and sing "Jesus loves me". Without practice we managed to pull off a fun and exciting song which went over very well. Dana and Ann (F) still eager to sing then got back up shortly after and sang "making melodies". For those who don't know this fantastic song comes along with interactive movements! Confidently, Ann and Dana went right at it and put many smiles on faces as everyone joined in. Finishing the service, we headed out back to feed the families. There was prepared rice and beans. Jill, Julia and Blair were eager to serve the food, while serving the food, the rest of the group was being loved and cherished by the many families present at the centre. It was beautiful to see the faces and emotions of the children and families when they received their food. Overall, we had an amazing, smooth, beautiful, spiritual and exciting day here in Managua! We are excited for our next 13 days here! Finishing up for the day, we are preparing for our first medical clinic located 2 hours away from Base. We look forward to updating you tomorrow on our experiences, and appreciate your prayers, love and blessings as we work here through God. We truly feel the presence of your spirit and prayers here with us. Jill, Julia, and Hannah preparing the crafts for tomorrow's clinic. Awesome start to our mission trip. At 9 a.m., approximately 20 family and friends began to gather and help our team load the forty 35-pound hockey bags full of donated supplies and clothing onto the school bus fabulously donated by Martin Transit :). With a single pitstop in Orangeville, 4 of our out-of-town additional team members were picked up and we excitedly continued onto the Toronto Airport with plenty of time to spare. Sitting in the airport, I was reminded of the rare opportunity each of us have ahead of us to grow spiritually with such a wonderful group of people ranging from age 12 to ....an undisclosed age. 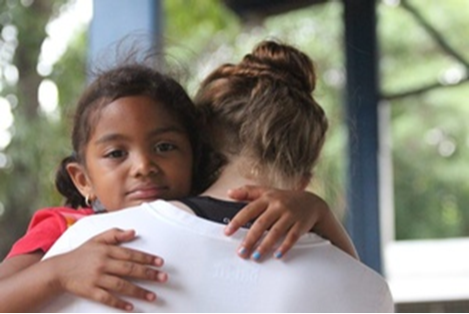 We send hugs to our many loved ones who helped make this trip possible in countless ways. We carry a special place in our hearts Kathryn and Ted who we know wanted to make this journey with us and thank Anne who jumped in last minute and will be joining us on Sunday. 11:30pm (1:30am Canadian time): We have finally arrived after a long day! Everyone is tired but intact. Our travels were blessedly uneventful! Now we are settling into our rooms and thinking of sleep. More to come, so stay tuned. Covered by the Sun Times! Check out the article written in the Sun Times covering our trip. The countdown is on - 7 days and counting! Our team has spent the last several months getting ready, planning, and anticipating the adventures we will have in Nicaragua. We have been praying for the people we meet and planning how we can best serve them in the name of Jesus. Over the next few days, our itinerary will be finalized, our bags packed, and we will tie up any loose ends we need to before our departure. Stay tuned for more details of our trip and our experiences. And don't forget to pray for us!